Okra Apartment – excellent spot to map the city! Okra apartment is a cozy home in the center, between historical buildings. A perfect flat for couples or friends even for a longer stay. Its bathroom with bathtub and its well-equipped kitchen provide a pleasant stay! 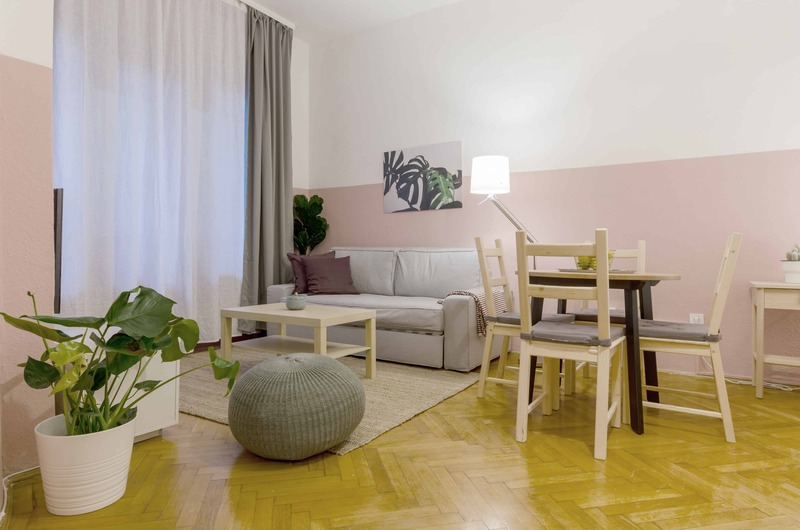 Okra Apt is a classy little space right in the middle of Budapest downtown. It is fully equipped for every need, and provides a comfortable stay for up to 4 people. The location could not be better – sights, restaurants, bars, clubs, a park and a marketplace are just a stone’s throw away. The main public transport junction is also just 5 minutes away. The green square close to the house is the perfect place to go to with kids or to walk your dog, and in the marketplace nearby you can buy anything. It mainly sells groceries and Hungarian street food, but it hosts a flea market too, with vintage clothes and designer jewelry. There are lots of design and fashion shops in the area too.